Kidney stones and chronic kidney disease are two painful and potentially very dangerous conditions. More than 26 million Americans suffer from chronic kidney disease, and that number is projected to rise. You can include kidney-cleansing fresh juices in your daily diet as a simple preventative measure. Choose low-potassium or high-calcium fruits or vegetables to make your fresh juice. 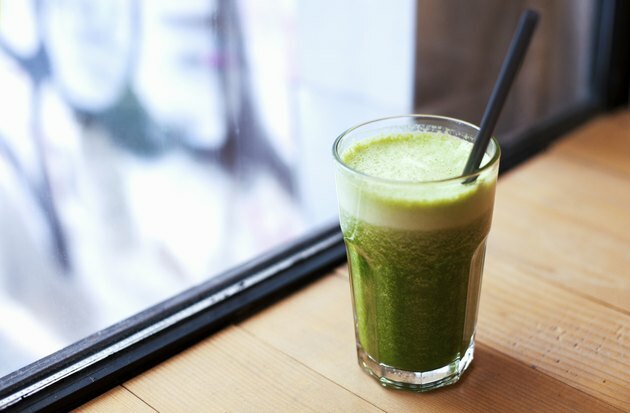 This dark, leafy green vegetable might be more common blanched and on your dinner plate, but the leaves and stalks of the plant make a nutritious juice that is rich in calcium. According to the Linus Pauling Institute, a diet high in calcium can help with the prevention of kidney stones. A 2-cup serving of fresh kale makes 1/2 cup of fresh kale juice, containing 201 milligrams of calcium per serving. This is 15 percent to 20 percent of the recommended dietary allowance of calcium for adult men and women, including pregnant and breast-feeding women. Staying well-hydrated is one of the most important ways of preventing kidney stones. According to MedlinePlus, a minimum of eight 8-ounce glasses of liquid are recommended each day, with the majority being water. You can substitute fresh juice to meet this requirement, however, and Harvard Health Publications suggests citrus juices -- such as grapefruit or orange juice -- as the citrate content helps prevent kidney stones from forming. Apple juice is naturally low in potassium, which is important for those suffering from chronic kidney disease. As your kidneys regulate your body's potassium levels, a diet high in potassium for those with this condition can lead to severe complications. Choosing a low-potassium juice can help you stay hydrated without increasing your risk of consuming too much potassium. A 1-cup serving of chopped, fresh apples makes 1/2 cup of apple juice, with only 134 milligrams of potassium per serving -- a little under 3 percent of the recommended dietary intake for adults. Like apples, pineapples are also naturally low in potassium, making them a nutritious and hydrating juice that is safe for those who suffer from kidney disease. A 1-cup serving of chopped, fresh pineapple produces 1/2 cup of fresh pineapple juice, which has 180 milligrams of potassium per serving. This is less than 4 percent of the recommended dietary intake for adults. What Are the Benefits of Beet & Apple Juice?